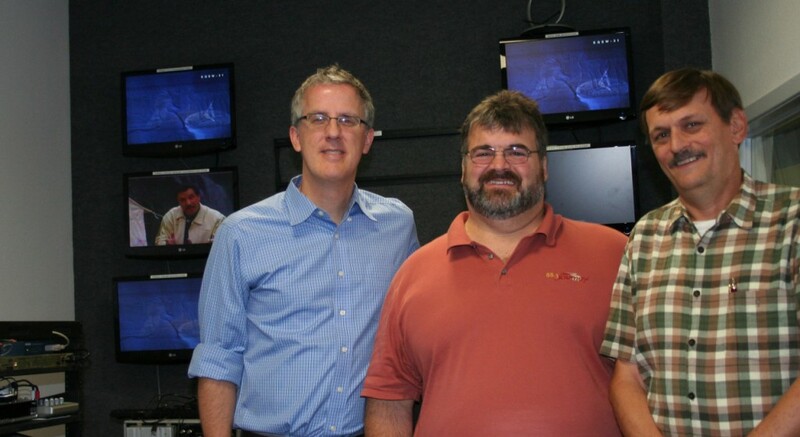 Trent Truman, Mike Agee and John Williams add new blood and new ideas to the Communication Department. Probably no other academic department at Southwestern Adventist University has been affected more by the incessant changes in technology than Communication. The term media no longer just refers to broadcast TV and radio stations, newspapers and magazines. With the advent of the Internet, social networks and more recently, smart phones, the lines continue to blur between one medium and another. And that expectation hits the classroom as well. It’s not enough to keep up to speed on the latest software. Students and professors are having to learn new techniques to communicate, and the ability to multitask and be multi-talented. In light of this, the communication department has made some radical changes in both the academic program that students are being offered as well as the media used to teach those students. Gone is the day of multiple majors (Journalism, PR and Advertising, Radio-TV-Film). Media convergence calls for students to have multiple skills, even if the department still offers emphases in the three previous majors, as well as a new emphasis: Graphic Communication. The new specialty is offered as a 38-hour B.A. degree and is the result of a continuing demand by students for more graphics courses. But a new approach calls for new resources and new personnel. Fortunately, Southwestern has heard the call. A year ago, administration voted to make a major commitment to the campus radio station. A significant financial investment was made in the new station, 88.3 The Journey, which resulted in new, state-of-the-art equipment. More importantly, the station is now managed by Mike Agee, two-time winner of the Dove Award for Best Christian Station for his work at KTSY in Boise, Idaho. From a humble beginning operated by Agee and a handful of academy students, KTSY went on to be one of the top contemporary Christian stations in North America. Agee arrived in Keene last summer, not only to reestablish the campus radio station, but to enter the classroom, ready to teach communication students the business of radio. But all that is old news. This year, two new faculty members have joined the communication department as adjunct faculty. Trent Truman will be taking the lead in graphic communication. With two bachelors degrees—one in studio art: design and the other in graphics/packaging—and 19 years as a designer at Review and Herald Publishing Association, he brings extensive design and graphics experience to the department. He has a comprehensive understanding of typography, illustration, color theory, pre-press and printing, and is adept with Quark Xpress and the Adobe Creative Suite programs. To make him feel more at home, as well as help students prepare for the industry standard, the department is putting finishing touches on a new Mac lab complete with 15 brand new iMac computers loaded with Adobe Creative Suites CS5 software including Photoshop, InDesign, Illustrator and other design, graphics and web programs. TV and film production classes will now be taught by John D. Williams. Alumni might remember his name, because he served as a communication professor and TV station manager at Southwestern from 1987 to 2001. With a B.A. in communication from Mansfield College in Pennsylvania and a M.A. in communication from Bowling Green University in Ohio, Williams has the education to go along with more than 30 years of teaching. He will be in charge of the classes Digital Media Techniques, Motion Graphics, Video Production I and II, and Digital Film Production. But beyond learning techniques and technology, the faculty in the communication department agree that content is what’s important, and in that sense, a strong Christian foundation is key. “All around us, souls are desperately searching for answers to life’s problems,” adds Williams. “In greater and greater numbers, they are looking to television, YouTube, Facebook and blogs for those answers. But what good does it do for people to be connected to information if all they do is wallow in what the world has to offer?